At the beginning of the 20th century, astronomers were unsure of the size of our galaxy. Generally, they believed it was not much greater than a few tens of thousands of light years across, and perhaps considerably less. (A light year, nearly six trillion miles, is the distance traveled in a year moving at the speed of light in a vacuum.) Also, observations early in the 20th century made it seem that our solar system was near the center of the galaxy. The way astronomers were misled is explained here. the Sun occupies a fairly central position. This vision of the universe was soon replaced with a revolutionary new conception, based largely on the observations of the American astronomer Harlow Shapley at the Mount Wilson Observatory. The astronomer and scientific entrepreneur George Ellery Hale had founded the observatory on a mountain peak overlooking Los Angeles in 1904, and four years later master instrument-builder George Ritchey completed a 60-inch reflecting telescope designed specifically for astronomical photography. The first hint of a drastically revised understanding of our galaxy came in 1916. Studying a "globular cluster,"a group of hundreds of thousands of starsShapley noticed faint blue stars. If they were similar to bright blue stars near the Sun, they must be about 50,000 light years away to explain why they looked so faint. He pushed ahead to establish distances more conclusively using a new and ingenious method of measuring the universe. Shapley built a new understanding of the universe by measuring distances to stars based on properties of a type of variable stars called "Cepheids" (named after the constellation Cepheus, in which a typical such star was first noticed). They are giant stars, and thus visible to great distances. Each Cepheid varies in brightness over time. In 1908 the American astronomer Henrietta Leavitt had pointed to a remarkable rule that Cepheids obey. During routine comparisons of photographs she discovered variable stars, brighter on some photographs and fainter on other photographs taken at different times. Leavitt noticed that the brighter the variable star, the longer its period. The 16 variable stars Leavitt measured were all in the same group of stars, the Small Magellanic Cloud. Thus they were all approximately the same distance from the Earth. Therefore their apparent magnitudes (observed brightness) were directly related to their absolute magnitudes (intrinsic brightness, as it would be seen at some arbitrary standard distance). The conclusion was a remarkable "period-luminosity relation"the longer the period, or time, from a Cepheid's maximum brightness to minimum and back to maximum, the greater the intrinsic luminosity of the star. How did astrophotography become a useful tool? The period-luminosity relation for Cepheid-type variable stars—the curve showing how their brightness varies over time - as established by Harlow Shapley in 1918. An astronomer henceforth could observe the period, or time from one maximum brightness to the next maximum, for any other Cepheid variable star, and then read off the graph the star's absolute magnitude. Comparison of this estimated absolute ("real") magnitude with the observed apparent magnitude yields the distance, since brightness diminishes with the square of the distance. Assuming that the system of globular clusters was sort of a galactic skeleton, Shapley had the galactic outline, its size, and the place of the solar system within it. The Sun was far toward one edge of the galactic plane, not near the middle. He showed that the system of stars was ten or even a hundred times larger than previous estimates, and that the Sun is many tens of thousands of light years away from the center of the galaxy. The system of globular clusters, which is coincident in general, if not in detail, with the sidereal arrangement as a whole, appears to be somewhat ellipsoidal. Shapley used the period-luminosity relation to estimate distances. First, he collected all the available data on Cepheid stars, from his own observations and from other astronomers including Leavitt. The distance to some of the nearer Cepheids had been measured, and thus Shapley could figure out their absolute magnitudes. The only physics he needed was the simple rule that brightness decreases with the square of the distance. Then Shapley graphed period versus absolute magnitude. [The period-luminosity curve is] based upon more than 230 stars, and, except for zero-point uncertainty [the uncertainty in the distance measured by other methods to the nearer Cepheids], is probably correct within one or two hundredths of a magnitude. Shapley found that the globular clusters are arranged symmetrically around the galaxy, about as many above the plane of the galaxy as below. The clusters seemed to avoid the plane itself, the Milky Way. Shapley wrote that "this great mid-galactic region, which is peculiarly rich in all types of stars, planetary nebulae, and open clusters, is unquestionably a region unoccupied by globular clusters." Shapley acknowledged that there was an alternative explanation. Maybe globular clusters were not, as he believed, actually missing from the region, but instead were hidden by clouds of absorbing matter along the spine of the Milky Way. 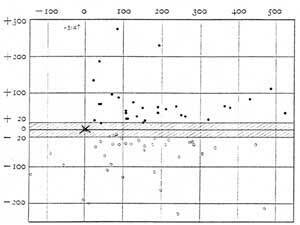 The distribution of globular clusters as measured by Shapley in 1918 (SIDE VIEW). The shaded area is the plane of our galaxy. The position of the solar system is marked by X, in the plane of the galaxy near the left side. Shapley marks the globular clusters by black circles above the plane and white circles below. There are about the same number above and below the plane of our galaxy. The galaxy as it was understood in 1919 (TOP VIEW), its shape and extent outlined by globular clusters, here shown projected on the plane of the galaxy. The solar system is in the small circle. 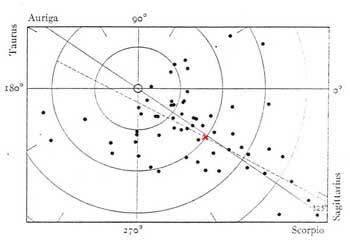 The dotted line is the major axis of the galaxy, with its center marked by the red X . The large circles have radii increasing by intervals of 10,000 parsecs, about 32,600 light years. The dwindling significance of humans and their particular planet had dwindled further still. Shapley noted a historical progression from belief in a small universe, with humankind at its center, to a larger universe with the Earth further from the center. The geometry had been transformed from geocentric to heliocentric to a-centric. The psychological change was no less, he insisted, from homocentric to a-centric. Some astronomers had long doubted that the solar system was near the center of the galaxy and that people enjoyed a privileged place in the universe. They felt that the odds, given a random distribution, were small. Now Shapley gave this philosophical position scientific substance. Shapley's galaxy was far larger than any previous estimate (aside from earlier guesses of an infinite stratum of stars). It might indeed be the entire universe. 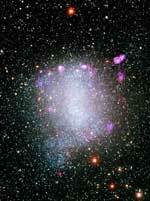 For Shapley had showed that globular clusters were clearly part of the galaxy, not independent island universes. Other nebulae (concentrations of stars and dust), especially spiral-shaped ones, might still lie outside our galaxy. But if they were similar in size to our now enormous galaxy, they seemed implausibly large. Separate island universes were not impossible, but they seemed less likely now that Shapley had multiplied the size of our galaxy many fold. From the new point of view our galactic universe appears as a single, enormous, all-comprehending unit... The adoption of such an arrangement leaves us with no evidence of a plurality of stellar 'universes'. Shapley defended his conclusions in the so-called "Great Debate" before the National Academy of Sciences on 26 April 1920. His major concern was the size of the galaxy. His model of a drastically larger galaxy, with the solar system far from its center, was largely correct. But he was on less solid ground when he argued that the spiral nebulae, which seemed to be much smaller, were part of our galaxy. His opponent, Heber Curtis, argued that the galaxy could be as large as Shapley said, yet still be only one of many island universes, if it happened by chance to be several times larger than the average. Ultimately observations would prove Curtis correct, but in 1920 Shapley had the stronger position. You can read more about the Great Debate here. The centuries-old debate was resolved only by new scientific evidence, produced using larger telescopes and new observational techniques, including photography and spectroscopy. The key proponent of island universes was Edwin Hubble, who like Shapley did his revolutionary work at the Mount Wilson Observatory. The irregular nebula NGC 6822, what would now be called a nearby dwarf galaxy. Thanks to the 100-inch telescope, Hubble was able to detect variable stars here, although it is (by modern measures) 1.5 million light years distant. 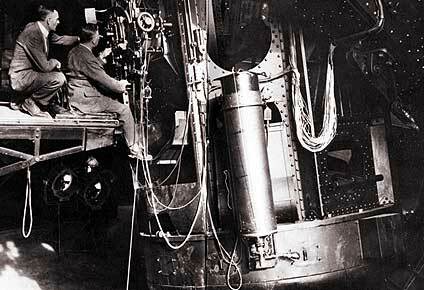 Edwin Hubble and the British scientist James Jeans at the side of the 100-inch telescope on Mt. Wilson. Writing in his doctoral thesis in 1917, Hubble noted that catalogs already included some 17,000 small, faint nebulous objects that could ultimately be resolved into groupings of stars. Perhaps 150,000 were within the reach of existing telescopes. Yet, he wrote, "Extremely little is known of the nature of nebulae, and no significant classification has yet been suggested; not even a precise definition has been formulated." The way Hubble discovered to classify nebulae is described here. After serving in World War I, Hubble joined the Mount Wilson Observatory staff. There he took photographs of nebulae with the new 100-inch reflector, the most powerful telescope in the world. Hubble discovered variable stars in an irregular nebula (cataloged as NGC 6822). By now Shapley had left Mount Wilson for the Harvard College Observatory. Hubble wrote to Shapley in 1923 to tell him of the discovery. 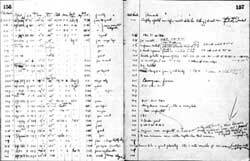 Hubble also said he was going to hunt for more variable stars and to investigate their periods. Shapley wrote back, "What a powerful instrument the 100-inch is in bringing out those desperately faint nebulae." Early in 1924 Hubble wrote to Shapley again. This time Hubble reported, "You will be interested to hear that I have found a Cepheid variable [star] in the Andromeda Nebula [M31]. I have followed the nebula this season as closely as the weather permitted and in the last five months have netted nine novae and two variables." The nearby planetary nebula in Lyra, as photographed in the 1920s. The central region of the spiral nebula M31. This plate was taken with a 9-hour exposure over two nights in September, 1920, with the Mount Wilson 100-inch reflecting telescope. The Cepheid is in the upper right corner, marked "VAR!" for Variable.
" But Hubble soon realized that he had found not a nova but a Cepheid-type variable star. When he found a Cepheid variable, Hubble realized he held the key to distance. As Shapley had used the period-luminosity relation for Cepheids to find distances to globular clusters in our galaxy, so Hubble could find the distance to the spiral nebula M31. 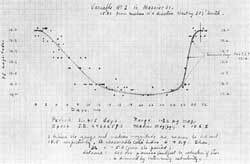 The curve of luminosity of the first Cepheid variable star discovered by Edwin Hubble in the Andromeda Nebula, M31. Using this he could determine the nebula's distance. 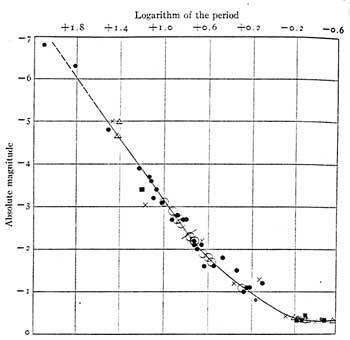 Hubble included this graph in his 19 February 1924 letter to Harlow Shapley. Hubble found that "the distance [to M31] comes out something over 300,000 parsecs." This was roughly a million light years, and several times more distant than Shapley's estimate of the outer limits of our own galaxy. Hubble continued: "I have a feeling that more [Cepheid] variables will be found by careful examination of long exposures." Here is the letter that has destroyed my universe. On reading Hubble's letter, Shapley remarked to a colleague who happened to be in his office, "Here is the letter that has destroyed my universe." 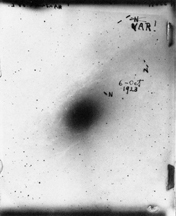 Shapley admitted that the large number of photographic plates that Hubble had obtained were enough to prove that the stars were genuine variables. By August, Hubble had still more variables to report. Shapley was glad to see this definite solution to the nebula problem, even if it refuted earlier evidence against spiral nebulae as island universes. Some of the evidence against spiral nebulae as island universes was based on a mistake, as explained here. Hubble's discovery of Cepheid variable stars in spiral nebulae, and the distance determination confirming that spiral nebulae are independent galaxies, were officially announced on New Year's Day, 1925, at a meeting of the American Astronomical Society. He followed this preliminary paper by further work over the next four years, with convincingly voluminous detail. A good part of Hubble's genius, and much of the acceptance that his revolutionary conclusions commanded, were due to lots of hard work. Before the 1920s ended, astronomers understood that the spiral nebulae lie outside our own galaxy. In the previous decade Shapley had multiplied the size of the universe by about ten times. Hubble multiplied it by another ten - if not more. Hubble's universe was no longer the one all-comprehending galaxy envisioned by Shapley. Henceforth the universe was understood to be composed of innumerable galaxies spread out in space, farther than the largest telescope could see. Hubble next would show that the universe is not static, as nearly everyone then believed, but is expanding. What he had made infinite in space, he would make finite in time.